Under maritime law, a crew member is entitled to maintenance and cure for injuries or illnesses that manifest or become aggravated during the service of the vessel. Maintenance is a daily stipend to pay for room and board expenses while the seaman recovers from an injury or illness. Medical cure is the cost of medical expenses related to treating the medical condition. Unearned wages are the wages the seaman would have earned until the end of the voyage or contracted term of employment. If you sustained an injury or an illness while in the service of the vessel and your employer is not paying maintenance and cure, contact us today to see what we can do to assist you. At Kraft Davies, PLLC, our lawyers have more than 65 years of experience helping injured fishermen, fish processors, crab boat crews, fishing tender crews and other maritime workers in collecting damages for injuries caused by unsafe conditions on boats. Under the Jones Act and general maritime law, you may have the right to obtain damages for lost wages, pain and suffering caused by your injury, the cost of retraining if you cannot return to work at sea, and other damages that depend on the specific facts of your case. We offer a free consultation to injured fishermen, fish processors and other crew members to examine the specific facts of each case. Contact us at 206.624.8844 for diligent advocacy from seasoned admiralty and maritime injury attorneys in Seattle. For decades, our lawyers have represented the hardworking crews of tugboats and barges in serious injury claims under the Jones Act and general maritime law. Having handled cases for years, our lawyers are familiar with the safety policies of most of the major tug companies working in Puget Sound, Alaska and the Columbia River. We understand the equipment used on the tugs and how unsafe conditions or practices can lead to injuries. We work hard to make sure that our clients obtain the financial compensation necessary to give them hope and dignity following an injury. For decades, our maritime injury lawyers have represented the hardworking crews of Washington state ferries in serious injury and wrongful death cases. We have tried multiple cases to verdict against Washington state ferries, understand the safety management system in place on the ferries and have seen firsthand how unsafe conditions and practices on the ferries can change lives forever. We are proud to represent these hardworking men and women in the wake of injuries on the ferries in Puget Sound. Holland America Cruise Lines, Windstar Cruise Lines and Seabourn Cruise Lines are Seattle-based companies that operate cruise ships in the United States, Europe, Asia, South America and elsewhere. If you are injured on a cruise ship owned by one of these companies, you are required to bring your lawsuit in federal court in Seattle within one year of your injury. Failure to file a lawsuit within a year of your injury may result in the dismissal of your claim. For decades, our lawyers have represented injured cruise ship passengers in claims against Holland America Line, Windstar Cruises and Seabourn Cruise Lines. When unsafe conditions lead to injuries on cruise ships, our maritime injury lawyers are here to represent injured cruise line passengers. We offer a free consultation to injured cruise ship passengers. For decades, our maritime injury lawyers have represented the crews of tankers, cargo ships and freighters in the wake of injuries at sea. We understand that unsafe conditions and practices on ships can have lifelong consequences for injured seamen and work hard to obtain for our clients the financial resources necessary to make a full recovery after a serious injury. 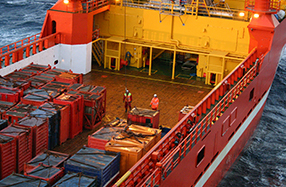 We offer a free consultation to injured blue-water seamen, cargo crews, freighter crews and other seamen injured on ships. For more information or to schedule an appointment with an experienced admiralty and maritime lawyer, please contact us or call 206.624.8844 for a free initial consultation.